The proliferation in terrorist activity has provoked an increase in the body of law, both at national and international level, which has sought to counter and prevent it. The bodies involved in this process range from the UN Security Council to government legislatures. This book is the first to address, in one volume, the wide variety of responses to terrorism as they exist in both international and domestic contexts. It also represents the first ever comprehensive collection of documents referring to terrorism which are to be found in the laws of the UK and France as well as in international law. 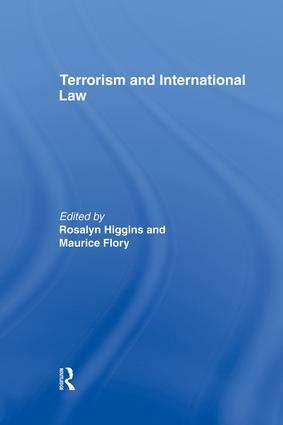 Terrorism and International Law comprises contributions by thirteen well-known authorities in the areas of international, French and UK law, and is divided into four main sections: international cooperation against terrorism, the French and British responses to terrorism, the limits of state action and a documentary supplement. The contributors have sought to show how international and domestic law can be used together to combat the multi-faceted problems which terrorism raises. The issue of human rights is also discussed with particular reference to the jurisprudence of the European Commission and Court of Human Rights. The fourth documentary section of the book provides coverage of international treaties, UN resolutions, UK and French legislation, case-law and official statements relating to terrorism. This book provides an invaluable source of commentary and reference material in the area of terrorism and international and domestic law which will be useful for practitioners, diplomats, students and teachers.